IT’S ALIVE!!! IF PARTIALLY BRAINDEAD. The comic is brand spanking new even though we’ve been plotting it for quite a while now. For the last year we’ve been working on a draft of a novel and we forced ourselves to set Shounen Fight aside lest it be a huge distraction. But the moment we finished the draft, we picked Fight back up and have been working on it furiously ever since! We hope you enjoy it in all of its unadultered silliness and borderline bad taste. At the moment we’re not going to restrict ourselves to a timeline, though we’ll be trying to add at least a page a week, more than likely on Mondays. (Although next week we’ll be in Hawaii all week so we’ll see how THAT goes. Rainforest or COMPUTER?) In any case, if you want to keep track of the comic, you can follow our Twitter and we’ll tweet when we upload a new page. In the mean time, however, I’m having a blast drawing Mahou Shounen Fight! 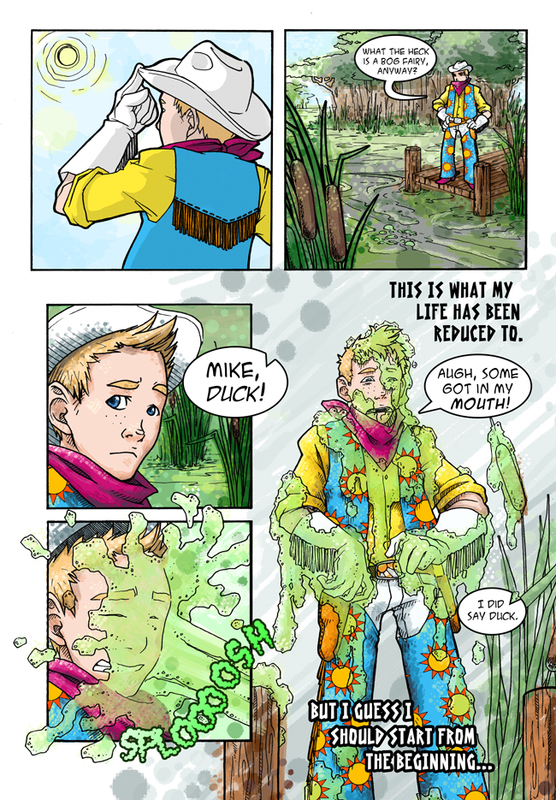 You only get to meet Mike in these first two pages, but MSF’s cast is huge and chock full of strange and colorful characters whom we hope you’ll love reading about as much as we love writing/drawing them.